Snapchat wants to usurp Instagram as they way to share Coachella Music Festival adventure. So today it revealed a new style of Geofilters that change throughout the day to tell friends what they’re looking at. Rather than just a generic “Coachella” illustration that can be overlaid on photos or videos all day, Snapchat has different ones for each Coachella band that are only available while they’re playing. That means the same geofenced area will get a different filter every hour or so. These more bespoke filters could encourage users to share shots of each band they see with friends and their Story followers, not just a single pic. And since the filters can only be used if you’re actually at Coachella, they stoke the sense of hip exclusivity that’s rampant amongst the music festival’s attendees. To add the filters, Snapchatters can just take a photo or video, and then swipe left or right on their screen while previewing them. Coachella attendees will be able to submit Snaps to the festival’s Snapchat Our Story, which the startup will curate so people at home can see what it’s like to be there. As you can see here, the Sahara EDM rave tent filter features a neon rainbow of colors, while the nightclub-esque Yuma tent filter shows off a discoball. The camping area and even the parking lot have their own filters too. But what’s special today is that artists like Drake and St. Vincent will have their name appear in timed geofilters. If you think this all seems silly, maybe you’re right, but you’re probably misunderstanding a fundamental truth of Snapchat: It’s about unique experiences. An Instagram of a sunset could be an Instagram of any sunset anywhere. But a Snap of the sunset while Hozier sings “Take Me To Church”, tagged with his Coachella Stage geofilter means you were somewhere special. When so many of the possessions that define us have been digitized, like photos and music, experience is how members of the next generation differentiate themselves. 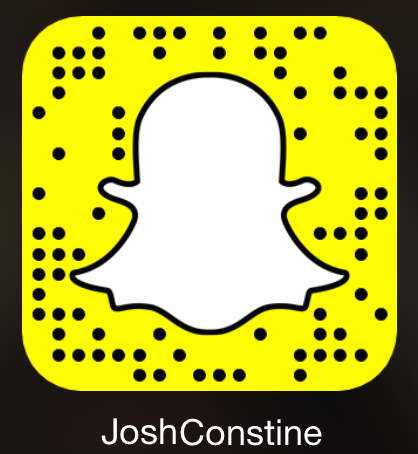 And for demos of new features, plus a funny look at life in Silicon Valley, add me on Snapchat at ‘JoshConstine’ or focus your Snapcam on my QR Snaptag below.